We were on our way to the movie theatre and I’d packed a bag of pistachios to avoid buying popcorn. We were already munching on them during the drive. My husband maneuvered the steering wheel with his knees to crack open the shell and pop a pistachio in his mouth. “Ever notice the pistachios with their shell on taste better than those with their shell off?” He asked. “These nuts are delicious!” Ryan screamed from the back row. “You should ask Google if this has been studied,” Orlando suggested. I ran a quick search on my iPhone. “They’re yummier and less fattening!” I joked. “For a long time I’ve suspected the reason stone crabs and king crabs are so delicious is because it takes so much effort to get a little piece of meat.” Orlando noted. “The best peanuts are the ones from baseball games and those come in their shell also,” I added. Our observations stirred up an interesting conversation with our kids about delayed gratification and how important it is to work for what you want. When things come too easy, you don’t appreciate them as much. That’s why people don’t read books they receive as gifts and the reason 70% of lottery winners end up in bankruptcy. But any time you have to use your time, energy, and/or money to achieve a goal, it becomes more valuable. Investing in something with your own money makes it more likely you‘ll take it seriously. Saving for months to buy something you’ve had your eye on causes you to be more grateful when you get it. We laughed at his clever analogy. “Yes! Pistachios do taste like success,” I gave Justin a high-five. 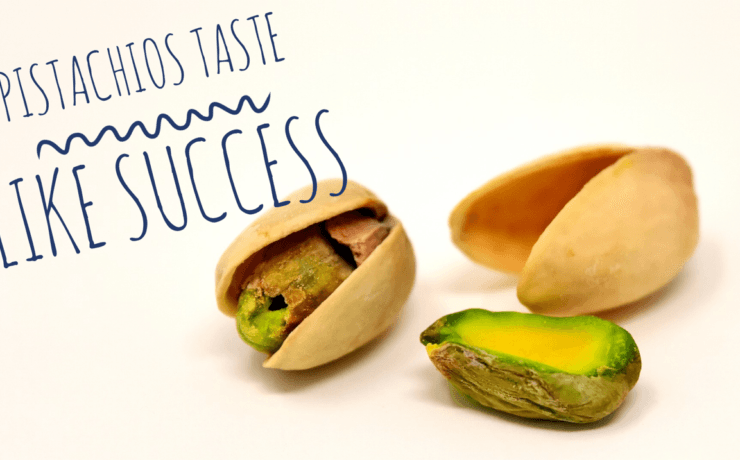 So the next time you feel you’re stuck in the trenches trying to get ahead or it’s taking too long for you to achieve your goals, just remember you’re cracking the pistachio open. Yes, it’ll hurt your fingers. Yes, there will be shells that are closed so tight you can’t break them open. But when you land that deal; when you lose the weight; when you pay off that debt; when you write the book; when you reach your goal… that’s when you know you’ve cracked the shell. Rewards are greater when you earn them. Put the effort in. Work for it. Endure the process. Nothing will taste better than sweet success.